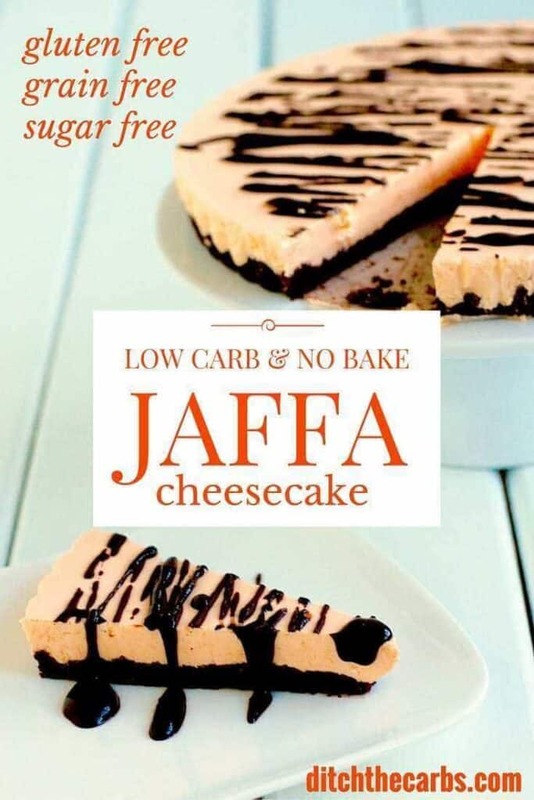 Low carb no bake jaffa cheesecake – it’s a doozy. It also happens to be sugar free, grain free, wheat free, gluten free cheesecake. Oh yeah. For those who don’t know, Jaffa, is a type of orange. Jaffa is also commonly used by many people to describe the amazing combination of chocolate and orange. Numerous sweets, cakes and chocolates have this chocolate-orange combination. I was brought up on Jaffa cakes, Terry’s chocolate orange and hard little ‘Jaffa’ balls. The chocolate-orange sweets that every kiwi kid takes to the movies and rolls down the aisles. So I wanted to create that Jaffa, choc-orange flavour in a low-carb cheesecake. My new low carb no bake Jaffa cheesecake is quick, easy, and will bring back all those Jaffa memories. 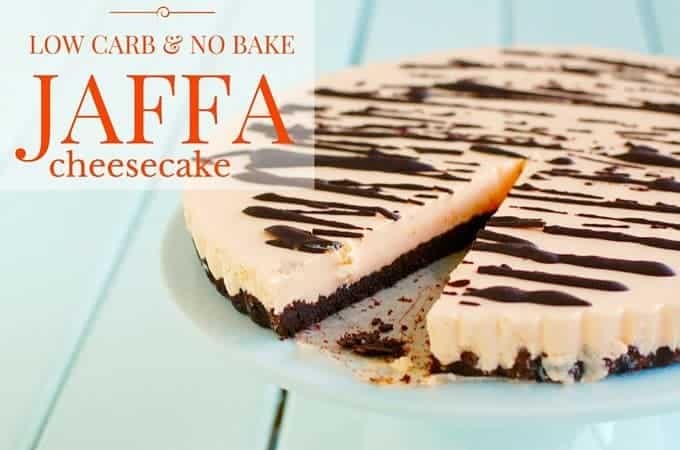 You can prepare the low carb and no bake Jaffa cheesecake in the morning, and by dinner, it will be ready to serve. You might also like to prepare low carb no bake Jaffa cheesecake into individual ramekin dishes for individual servings. A note regarding sweeteners. It is difficult to find sugar free jelly that has acceptable sweeteners for long term and regular use. For beginners and those who are just wanting a quick and easy dessert, using the occasional box of sugar free Jello may be acceptable. For those of you who would like to avoid artificial sweeteners I have also given an alternative in the recipe notes below. 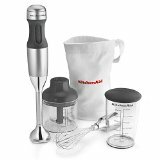 I try to make my recipes as easy as I can, which is especially important to my readers who are new here and have never done any home cooking from scratch. The beautiful chocolate-orange taste in the low carb no bake Jaffa cheesecake is hard to beat. Easy to prepare and can be ready in a few hours. Serve as one large dish or individual serving glasses. Mix the melted butter, almond meal/flour, cocoa and sweetener together. Press into a greased and lined dish. Press down firmly with the back of a spoon or the bottom of a glass. Place in the fridge to harden. Pour the two orange sugar free jelly boxes/sachets into a pouring jug and add 500ml of boiling water. Stir to dissolve. Cut the cream cheese into chunks and add to the boiling jelly mixture. Using a stick blender with the blade attachment, puree until smooth and lump free. Pour the jelly and cream cheese mixture onto the prepared cheesecake base and place back into the refrigerator to set for a few hours. Melt some dark 90% chocolate and drizzle over the top of the jaffa cheesecake. You may substitute the orange flavoured sugar free jelly/Jello with the following. Use 3 tsp (12g) gelatine powder, 4 tbsp orange zest, 2 tbsp orange juice, 2 tsp orange essence/extract and additional sweetener to taste. Watch this video which shows you how I make my lemon cheesecake with similar ingredients. Made this today. Very nice will definately make again. I skipped using artificial sweetener as I don’t like it so went sugar free. Didn’t use jelly either for the same reason. For the base I used almond meal then added cocoa powder & shredded coconut then enough butter to combine, no measuring. Once set in fridge put a thin layer of dark choc on base then set again. For the filling just cream cheese zest & juice of a lemon and an orange & gelatine. Drizzled with choc & set. Very happy with results. Very satisfying. Libby, when you list the ingredient “2 orange sugar free jelly 500ml/4 serve size,” do you mean boxes of sugar free Jello? I’m in the US, and am not familiar with that wording. But my two sons LOVE the combo of chocolate and orange, and I really want to make this for them. Thanks for all you do for us low carbers! Apologies for making this confusing. The recipe requires two sachets/boxes/packets of sugar-free jelly/jello. The boxes are each 500ml/4 serve size. I wrote this after one reader pointed out that in the US you have different size jello packets. I hope you enjoy this cheesecake, my children LOVE it. Hi Libby, I’m from Whangarei, NZ. I’ve recently started this new lifestyle and I can’t wait to make many more of your delicious looking recipes. I’d love to know which sweetener you use for this recipe? I’ve just tasted my first attempt and it’s delicious. Only one problem is the sugar like granulars from the erythritol I used in the base. Any ideas of what I could use next time? I tend to use Natvia (can be found in any NZ supermarket) or I buy Swerve from iHerb from the USA. They deliver worldwide. I’m having trouble reading the nutrition info, how many carbs are in one slice? 8g? I looovvveee that you are also in NZ! Can you please tell me what kind /brand of chocolate you get and what store please? And where do you get your almond flour? I can only find almond meal. Thanks so much! YAY welcome, my kiwi buddy! I buy Lindt 90% as the sugar-free sweeteners in NZ all seem to contain sorbitol, maltitol or other sweeteners I don’t use so I stick with Lindt 90% which is so low in sugar anyway. Yes, it is virtually impossible to buy almond flour here without costing an arm and a leg. Buy regular almond meal/ ground almonds – any supermarket brand will do. Watch this video I made. You can see all my kiwi pantry ingredients. I made the Jaffa, but was unsure what measurement “1/2 stick” of butter is to be used. My crust didn’t hold together, at all. My guess is that I didn’t use enough. Since I’m a beginner, I used the “sugar-free” Jell-O. Instead of using orange Jell-O powdered gelatin, I used cherry. It taste good. I’ve been enjoying it and trying not to eat it all at once. Hi! Ok….so I’m barely gonna make this but some things are confusing…like” jelly” which is what you spread on your PB&J sandwhich, Jell-O is the gelatin dessert, which is needed for this recipe….and on 1.1 lb of cream chz….what does that mean? 1 lb and a half??? Apologies for the confusion. In the US, Jell-O is a brand name for a gelatine based dessert which the rest of the world calls jelly. And in the US jelly is what we call jam. I can see how confusing this is. The 1.1 is a decimal place (now I know you have those in the US 😉 ) one point one pound. I used to use fractions but I received complaints that some didn’t understand fractions, so I changed to decimals in many of my recipes so there is no confusion. Who knew baking could be this tricky? Hi! Ok….so I’m barely gonna make this but some things are confusing…like” jelly” which is what you spread on your PB&J sandwhich, Jell-O is the gelatin dessert, which is needed for this recipe….and on 1.1 lb of cream chz….what does that mean? 1 lb and a half??? Also, “1/2” a stick is pretty much equivalent to 4-TBSP since most sticks are 8-TBSP, which equals to 1/2 a cup……but if more butter is needed, I’m sure adding a tablespoon or 2 won’t hurt…. Wow, I made this for a family dinner tonight, and it was amazeballs! There were only 5 of us so I halved the recipe and it was perfect (a few of us had seconds…). I’m the only one who eats lchf so I was worried everyone else would taste the sweetener, but it was not noticeable at all, everyone loved it! This was YUM! Thanks so much for posting the recipe – I loved how easy it was. I couldn’t find sugarfree orange jelly so used raspberry flavour instead. Such a good replacement! I also halved the topping ingredients (kept the base quantities as per the recipe) and made it as a slice in a 20cm x 20cm tin instead. I love how the texture of the top is kinda like marshmallow. I made this last week for my son, he loves chocolate oranges and I thought this might be a similar flavor. It was easy to make and so, so delicious! I got raves that it tasted and looked just like a fancy restaurant dessert! Thank you so much, also for the conversion to US. I am going to make this again using key limes with whipped cream topping for a key lime pie. Thanks from a happy family! 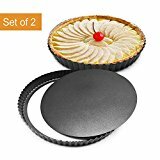 What is the best size pan to use for the cheesecake? My tart dish is 10.5″. I’m wondering if it is too large! I made this cheesecake today to share with my friends at dinner while we watched “Poldark” finale. It was the hit of the evening! Everyone loved it! It was delicious and hard to believe it was KETO. I didn’t get a reply regarding the correct pan size to use so I did not use my large tart pan and used a smaller pan. That was a mistake! There was enough cheesecake mixture to make two smaller ones. I didn’t need a second cheesecake! So if you make this recipe, use a larger tart dish. The 10.5″ would have been perfect. I also was out of almond flour. I used tiger nut flour which I’d never used before. It turned out fine, but I think it could have used more butter with the tiger nut flour so the crust would hold together better. It was still delicious! YUMMY!!! I made a huge one plus 6 ramekins! This time I have halved the ingredients. Your lemon cheesecake recipe has cold water in it as well as the boiling water. Did you mean to omit that here? I sometimes use half boiling water to dissolve the gelatine, then add the other half as cold water to speed up the setting times. This seems like a great recipe! I used real oranges to do it, and now is setting on the fridge. I also got some 90% chocolate to decorate. Do you just melt it and then decorate or is there another step? Thanks! Yes, I just melted it then drizzled it over the top for decoration. I can’t find instructions on how to assemble the cheesecake. Assuming just combine all dry ingredients and press into spring form pan for the crust. For the filling, am thinking to mix the Jello with the boiling water until it dissolves, then add the cream cheese. Refrigerate until firm then top with melted chocolate? What size boxes of jello? I can get both 4-serving and 8-serving boxes. I use two of the 4-serving box/sachets. Alternatively, you could just use one 8-serving box. We can’t buy those here, hence me using two of them. I absolutely love it that you have included the option to convert to US measurements. That makes everything so much easier for me. By the way, where are the instructions on how to make the cheesecake or do we simply follow the recipe/video for the lemon cheesecake with similar ingredients? Thanks for all you do. I’m so glad they are useful to you. i am now going through over 200 recipes making the conversions 🙂 Instead of using the Jello boxes, just add all the ingredients to the boiling water (as per recipe notes) and as shown in the video for my lemon cheesecake. I can’t seem to find non-spreadable cream cheese in the UK and so struggle with quite a few recipes, do you have any recommendations of products that may be available over here? Someone has commented before where they found blocks of cream cheese in the UK, so I’ll ask again in my support group for you. I remember I bought them when I lived there years ago, but it may have have changed. Was there ever an answer on where to find blocks of cream cheese in the UK? Could it be replaced with ricotta cheese? Yes, apparently it is sold in tubs in the UK but has the same nutrition. Goldessa, Lidl, Aldi’s own etc. 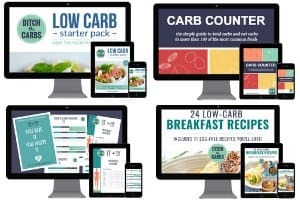 If you are a member of my Low Carb Support Group, you can read the thread here. Hi, I’m in the uk too. 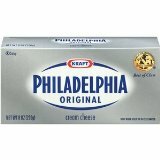 I just use full fat Philadelphia or Aldi’s own brand in the tubs. The recipes work fine.